(Bullets & Bracelets#1 (fb)) - "Final Thrust" - Diana Prince served the Wakandan King. 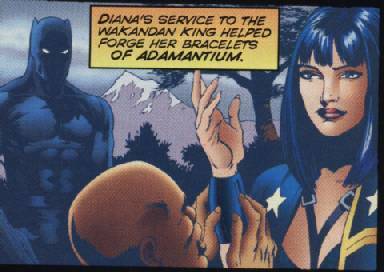 In return, the Bronze Tiger forged a pair of bullet-repelling Adamantium bracelets for Diana (Wakanda being the only source for the indestructible precious metal in the Amalgam Universe). (Challengers of the Fantastic#1) - "Four Against the Unknown" - Bronze Tiger found himself at the League of United Nations under the mediation of United States Senator Ben "Rocky" Grimm in an attempt to reach a diplomatic solution with Secretary of State Kragoff and the other representatives of Gorillagrad (formerly Gorilla City). Secretary of State Kragoff and his simian associates, Comrade Grodd and Congo-Red, alleged that primates had ancestral rights to all of Africa and thus claimed sovereignty over Wakanda as well (conveniently leaving out the fact that Homo Sapiens are primates too!). 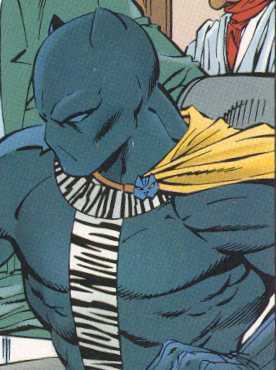 But Bronze Tiger was not about to surrender his country without a fight. Unfortunately, Senator Grimm had to abruptly abandon the mediation session when he was called back to Challenger Mountain to meet with Uatu the Guardian. Comments: created by Karl Kessel, Tom Grummett, and Al Vey; "Challengers Mountain O' Mail" letter column created by Tom Brevoort. Benjamin Turner first appeared in a prose novel called Dragon's Fists by Denny O'Neil and Jim Berry, under the pen name Jim Dennis. This novel was adapted by O'Neil into the first six issues of Richard Dragon. Richard Dragon and Benjamin might count as the first paperback original heroes to receive a comic book adaption.